Why do we need to Detoxify and Cleanse our Bodies? How has Detox Drops helped others? How long does a bottle of Detox Drops last? 21st Century life brings with it stress, environmental pollution, unhealthy diets and fast foods. Illnesses like cancer, heart disease, arthritis and other lifestyle conditions are becoming more frequent. Despite plentiful food supplies and excellent medical facilities, many people in the Western world do not really know what it is like to feel truly healthy, full of energy and bounce. Modern farming methods are often more geared to producing food which is 'bigger and better' - rather than food which is healthy and life sustaining. Even so-called 'healthy food' is full of artificial hormones, insecticides and other chemicals, which destroy the vitamins and essential nutrition of the food we eat. Research has shown that environmental pollution enters the blood stream via food, water supply and the atmosphere and causes levels of toxins to build up in the body. These toxins affect body functioning, especially the functioning of the liver. The liver is the second largest organ in the body and is often seen as the most important one. In traditional Chinese medicine, for example, a healthy liver is seen as the most critical element in the body's ability to fight disease and function optimally. Amongst other important functions, the liver is responsible for eliminating and detoxifying the poisons that enter our blood stream. It also produces bile which is essential in the breakdown of fats and is the organ which stores Vitamin A, D, E and K.
Combining the powerful detoxifying effects of Western herbal medicine and African herbalism, Detox Drops can help you to feel healthy, more energetic and full of life. Detox Drops may be used on their own or with EcoSlim in our our unique 5 day Detox and Weight Loss Program. Detox Drops are a 100% safe, non-addictive natural herbal remedy formulated for teens and adults containing a selection of herbs known for their ability to contribute to liver health and well-being. In this way, Detox Drops can be used as part of a gentle detoxification program to safely cleanse and flush out the system. It supports the body’s natural ability to remove toxins and waste by-products, without harmful side effects. By cleansing and refreshing all body systems, Detox Drops can also represent a wonderful start to any new program to stop smoking or begin a healthy weight loss program! One bottle Eco-Slim Slimming Drops to boost metabolism and energy levels, eliminate fat and control appetite. Note: EcoSlim, Detox Drops and the Feelgood Health 5-Day Email Detox and Weight Loss Program are all developed with care by our practicing Clinical Psychologist, are 100% natural, safe, and manufactured according to the highest pharmaceutical standards. Individual ingredients are well-researched and have been put to the test over the years as a complement to the treatment of real people with real problems. Caution: If you suffer with a chronic medical condition we advise that you consult your health care professional before embarking on any detox program. When in doubt, always consult your doctor. Safety during pregnancy or breastfeeding has not been established. "I have been battling with fatigue for many years. Every day I woke up feeling like I couldn't face the demands of the day - you know that feeling of "Oh No!" you get when you wake up? After taking Detox Drops for only three days, I started to feel more alive and my energy levels increased every day. Also my headaches disappeared and I have less hayfever than before. Detox Drops are great!" "I have always had bad headaches and have been to doctors, chiropractors, - you name it! Some helped but the headaches always came back. michele has helped me to see that I am poisoning myself with what I eat and that the pain tablets have been causing me to have more headaches. The Detox Drops have really helped. I haven't had a headache for weeks." "I live on junk food and I love it! I know I should eat healthy but it is difficult with my lifestyle. 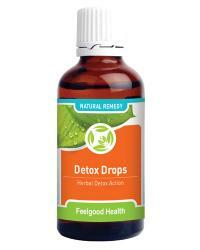 Detox Drops help when my body starts protesting too loudly!" "I take Detox Drops before and after a good party - I mean you are only young once! We all know the effect alcohol has on the liver and how you feel the next day, so I start taking them the day before and carry on for a day or two. I hardly ever have a hangover like I used to, thank goodness!" Taraxacum officinalis (Dandelion) Dandelion contains bitter principles which have a beneficial effect on the liver and digestive system. Dandelion is also a rich source of vitamins and minerals, including Vitamin A, D, C, various B Vitamins, iron, lecithin, silicon, potassium, magnesium, zinc and manganese. It enhances liver and gall bladder functioning and may decrease high blood pressure due to its diuretic properties. Foeniculum vulgare (Fennel) Fennel has been used since ancient times as an appetite suppressant and was traditionally used to prevent 'growling stomachs' during church services. Apart from its diuretic properties, Fennel also promotes the functioning of the liver, kidneys and spleen and is useful for acidic stomachs. Pelargonium reniforme is a medicinal plant known to generations of Khoi/San descendants and Xhosa traditional healers for its health-giving properties. Also known as 'Umckaloabo', it is traditionally used for a range of therapeutic functions and is well known for its beneficial effect on liver functioning and as a digestive tonic. This species of pelargonium is indigenous to the Eastern Cape of South Africa and grows wild, sending out long bulbous roots deep into the ground. The medicinally active ingredients are found in the bitter tasting root of the plant. Caution: Fennel and Dandelion should not be used in conjunction with any other diuretic medication such as Lasix or hydro-chlorothiazide. Not recommended during pregnancy or breastfeeding. Take 15 drops in appr. 1/4 glass water three times daily for 6 weeks. Follow up with a 5 day course every three months or whenever your system feels sluggish and rundown. NB: Make sure to drink at least 8 glasses of water every day while taking Detox Drops. If you do not drink enough water, you will become dehydrated and your body will not be able to flush out the toxins effectively. Tip: Use Detox Drops along with Eco-Slim for maximum weightloss benefits. Tip: Detox Drops may also be effectively combined with ImmunityPlus to improve liver and immune system functioning. Within a few hours there will be increased urination as the kidneys begin to flush toxins out of the body. (Make sure you drink at least 8 glasses of water a day to assist this process) Thereafter, you will feel a little more energetic every day. Day by day, symptoms like fatigue, lethargy, headaches, painful joints, acne, sinus, allergies, etc will decrease and energy levels and a feeling of well-being will increase. One bottle of Detox Drops will last 25-30 days. See our Special 3 + 1 Offer. Detox and cleanse your body by supporting your immune system! Super Skin pack: Acne remedy plus daily herbal wash and detoxing drops! Tissue Salt slimming remedy plus system detox cleanser! Slim Down Pack: Detox and flush out toxins then lose weight naturally! Address systemic Candida and flush out toxins!